Obesity is not a disease but may cause many other diseases. A person is said to be obese if his or her weight is about 20% more than required. Obesity is measured by knowing the body mass index of an individual. Body mass index or BMI is calculated by knowing your height and weight. It gives the measurement of healthy body weight but it does not tell anything about the measurement of body fat. There are different reasons that may lead to obesity. Many people eat more than required by their body. People who consume more carbohydrates may have increased body weight. Some people like to eat sweet things and due to this they consume more sugars. Eating more carbohydrates is the common cause of increased weight. Another important cause of obesity is living a sedentary lifestyle. Children do not play outside because of the discovery of television, video games, computers, mobile phones, etc. Even adults have made their life easier by doing all household work on machines. Due to less physical activity, people are suffering from obesity. Reduced sleep is also an important reason of becoming obese. Reduced sleep increases the risk of obesity both for children as well as for adults. Endocrine disorders or hormonal imbalances can also lead to obesity in some children and adults. Regular intake of certain medications also increases the risk of becoming obese. People who suffer from chronic health problems such as diabetes may suffer from obesity due to side effects produced by artificial hormone insulin or drugs that are taken for controlling blood sugar levels. 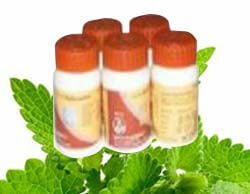 Divya Medohar Vati: This is an excellent herbal remedy that helps in controlling appetite and weight. It acts on the normal digestive organs of the body and helps to control appetite naturally. It is an excellent remedy that also helps to balance the hormones level in the blood. It stimulates pancreas to produce enough insulin hormone that helps in regulating the blood glucose level naturally. Divya Peya (herbal tea): This herbal tea is very useful in controlling appetite. This is a natural remedy that reduces appetite and helps in controlling weight. It provides nutrition to all parts of the body and also enhances energy of all body cells. It is an excellent remedy for obese people to control weight. Divya Triphala Churna: This helps in the optimum functioning of the digestive organs. It helps in controlling appetite and maintains normal hormonal balance. It also helps in regulating the functioning of different enzymes that helps in regulating the digestive functions in the body. It reduces flatulence and constipation. Divya Yoga DVD for obesity: This yoga DVD is an excellent product for obese people. In this DVD you will find natural ways to lose weight. It also gives you natural losing weight tips. This DVD is extremely useful for people who are overweight as they can watch this DVD to learn ways to lose weight naturally. It not only gives losing weight tips but also tells you about different yoga asana that you may do at home to lose weight naturally. People who want to control their weight naturally should take some precautions and should make some changes in their living or lifestyle to control their weight. It is very important that people who are overweight should try to control their appetite. One should eat three meals in a day or should make a proper routine of eating meals. This helps them to avoid overeating because it is very important to avoid overeating to control weight. One should try to eat dinner early in the evening. One should not sleep immediately after eating a meal. Minimum two hours gap should be kept between sleep and eating dinner. This helps in proper digestion of the food. One should eat a balanced diet to control weight. Excessive intake of fatty foods can lead to increased weight. Therefore, it is important to take different nutrients in required amount to maintain proper body weight. One should avoid drinking alcohol as it affects the functioning of the liver. Liver is an important gland of human body that helps in proper digestion of the food. Liver helps in the digestion of fats therefore it is important to avoid alcohol so that fats may get proper digested. One should try to perform physical activity during the day because people who remain seated for prolonged periods of time during the day may suffer from obesity in the long run. Mild physical activity is very essential for maintaining proper body weight. One should also reduce the consumption of sweet things such as candies, chocolates, etc. to reduce weight naturally. Junk food, candies, and chocolates are the main causes of increased weight in children. Lemon water is an excellent way of reducing weight. People who are obese should drink lemon water every day to reduce weight. Adding one teaspoon to a glass of warm water and drinking it every day also helps in reducing weight naturally. Another effective home remedy for reducing weight is that one should eat about 8-10 curry leaves in the morning. This greatly helps in reducing weight within two to three months. Add one teaspoon of lemon juice, one teaspoon of honey and a pinch of black pepper in a glass of warm water and drink this in the morning. This is an effective home remedy for reducing weight. Chew ginger pieces and lemon pieces two three times in a day. This helps in improving the digestive functions and also helps in reducing weight.